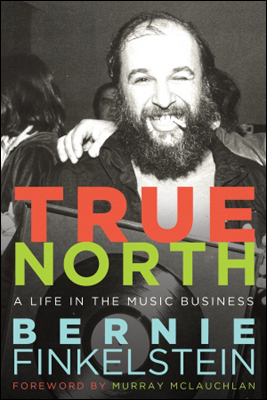 When reading True North, I had the overwhelming sense that Bernie Finkelstein was way ahead of the curve. He was, in fact, so ahead of the curve that in many cases he invented the curve. Finkelstein played a role in many things that are now part of the Canadian music industry landscape. Things like: CanCon, MuchFACT/VideoFACT and FACTOR. But the curve I’m referring to also includes how he did business. There’s a lot of talk these days about 360 deals and the Terry McBride income-through-music model. Finkelstein was doing this sort of thing way back. He was/is a manager, a label owner, a producer, a concert promoter and a publisher. Maybe back in the day that’s just what you had to do in order to survive or maybe he saw how all of the pieces of the music industry puzzle fit together. Either way, it’s impressive. What’s also impressive is quality of the artists he chose to work with and that many of those artists dealt with challenging subject matter. Bruce Cockburn has throughout his career written socially and politically charged material. Likewise Rough Trade’s lyrical content was beyond risqué for its time. I’m sure Finkelstein had the opportunity to work with “tamer” artists but he didn’t. And he still had hits! True North is a terrific book. If you’re a music business student like myself, I think you’ll absolutely love the inside look into early days of the Canadian music industry. Even if you couldn’t care less about record companies, concert promotion, management etc. the technicolor stories of copious drug use and snapshots of the glory days of Yorkville make this autobiography a real page turner.